ZERO EMISSIONS BATTERY-POWERED ELECTRIC TUG TO PULL LOADS UP TO 2000 KG Compact dimensions, ideal for transport and storage in narrow spaces Folding and height adjustable tiller for better comfort of use Butterfly accelerator, easy to control with your thumb Battery charger on board, display with light indication of charge status The TT-600 is a towing equipment, with three wheels and tiller steering. 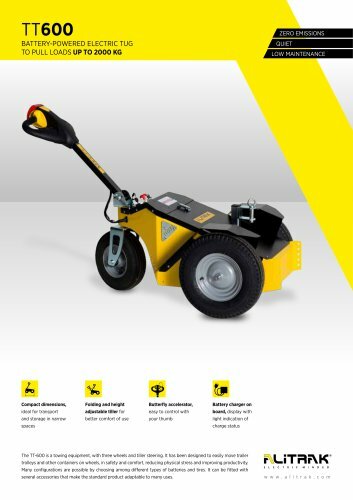 It has been designed to easily move trailer trolleys and other containers on wheels, in safety and comfort, reducing physical stress and improving productivity. Many configurations are possible by choosing among different types of batteries and tires. It can be fitted with several accessories that make the standard product adaptable to many uses.